The decision to re-start the Type 31e acquisition process and re-launch the competition to build the ships was preceded in August 2018 by a short period of market engagement with industry. On 14 August, the Defence Equipment and Support (DE&S) organisation, part of the Ministry of Defence, published what is known as a ‘prior information notice’ or PIN alerting potential suppliers to register interest in early market engagement ahead of the new process. Responding to media enquiries about the project, a Ministry of Defence spokesperson confirmed: “We have issued a Prior Information Notice for our new Type 31e fleet and plan to start discussions with industry…. to ensure we do not lose any momentum. Despite Ministry of Defence statements that the programme would not be delayed, unions representing workers at the yards that were hoping to build the frigates said the decision to re-tender the programme was a ‘body blow” and highlighted concerns about redundancies as the Queen Elizabeth class carrier programme runs down. Labour MP for Glasgow North East, Paul Sweeney, told the BBC’s Good Morning Scotland programme that the UK government’s policy on the frigate programme has been cast into doubt. He said: “Simply leaving it up to industry to come up with a price tag of £250 million [US$326.8 million] per ship was never going to work. They need to give confidence to industry that they are going to go with a consortium and then they will be able to invest with confidence to get the infrastructure right and the processes right to build a ship as cheaply and cost-effectively as possible. It was a wrong-headed approach from the start,” he said. The original plan laid out for the Type 31e frigates was cost-capped at £250 million per vessel. The aim was to select a design that would be built in sections by different yards in the UK, thus enabling work to be spread around several companies in the shipbuilding base. The Type 31e, in which the ‘e’ designates a vessel intended for the Royal Navy but designed to have significant export potential, arose out of a new naval shipbuilding strategy that included construction for the Royal Navy of the ‘cost-effective’ Type 31 Export or Type 31e design. As highlighted previously by Warship Technology, the UK’s much-vaunted national shipbuilding strategy includes a contract for five Type 26 vessels to be designed and built in British shipyards with its successor, the Type 31e, able to compete in the global warship export market. The original requirement for the Type 31e specified that the selected design meet the price of £250 million per ship – including development costs, risk and profit, whilst minimising the government furnished equipment burden and cost of ownership to the Ministry of Defence. It also specified a firm price contract for a first order of five ships and sought to maximise the ‘UK prosperity footprint’ and export potential of vessels offered, without compromising on cost and time, and sought as much adaptability, modularity, openness, and ‘agility’ from proposals as possible. The Ministry of Defence specified a ‘ship that navies around the world want to own,’ but with a UK-focused design and build strategy that maximised UK content. A request for information issued by the Ministry of Defence sought a ‘first return’ by mid-October 2017 in the form of an outline proposal and plan of intent, so that a first phase of dialogue could take place to understand how industry will meet the challenges involved in responding to the requirement for the export frigate. A second return was expected by December 2017 in order to undertake a further, more detailed and focused assessment with industry in early 2018. The Ministry of Defence planned to hold a number of ‘collaborative workshops’ with industry to discuss plans and proposals based on their RFI first return response. A second (final) return addressing how industry intended to address remaining issues was due on 1 December 2017. The Ministry of Defence intended to use the information obtained through the process to optimise any subsequent procurement process that it conducted. The T31e is intended as a general purpose light frigate, providing an enduring and continuous worldwide maritime security presence in several forward operating areas, releasing other, more complex warships to their primary roles. It will carry out various maritime interdiction tasks, such as counter drugs and counter piracy and also carry out defence engagement activities, such as port visits and official entertainment, demonstrations of military capability and participation in allied training exercises. It must be ready to respond to emergent events, such as natural disasters or evacuation of non-combatants and will routinely carry specialist emergency relief stores in certain operating areas. The T31e will usually operate alone, but will often be supported by, and interoperate with other assets from the UK and its allies, particularly NATO. However, the T31e will maintain the UK’s freedom of action to operate independently when it chooses. The T31e will also routinely operate with civil vessels and authorities, such as the US Coastguard, HM Border Agency and HM Revenues and Customs. On occasion it will operate with non-governmental organisations, such as specialist disaster relief organisations. To accomplish its tasks, the T31e will depend on organic sensors as well as deployable assets; such as sea boats and organic aviation system(s). It will operate predominantly in low threat conditions but will require credible offensive and defensive capabilities to deter aggression, survive attacks and provide reassurance. The request for information issued by the Ministry of Defence said the frigate will be required to operate year round, requiring good seakeeping for ocean transits and to allow its helicopter and boats to operate in a wide range of sea states and conditions. It will also operate in a variety of climates (hot, cold and humid). However, relaxation of functionality and performance is acceptable in extremes of climate that would otherwise drive significant additional design and cost, provided that personnel are afforded a safe working environment at all times. Operation in the vicinity of the marginal ice zone is not required. The T31e design will need to be adaptable, providing evolution paths for future capability to enable growth of the destroyer and frigate numbers into the 2030s, and to address export customers’ needs. Adaptability may include any combination of reconfigurable flexible design (including fit-to-receive), allowance for in-life upgrades or growth through follow on-batches. Based on existing Royal Navy manning structures, and assumed concurrent operational activities and manning states, it was assessed that accommodation should be provided for 137 personnel of all genders to carry out the T31e’s military tasks and roles. This would comprise a core crew of approximately 99 and allow for augmentation by up to 24 additional personnel (including helicopter, flight and maintenance personnel), plus an allowance for through-life accommodation growth of 14 bunks. Opportunities to reduce the crew numbers and associated accommodation were invited where it can be demonstrated that the ship’s operations can be achieved without unduly increasing the workloads of individuals; compromising personnel or whole-ship safety; introducing technical risks or costs that prevent achievement of the programme’s cost and schedule targets; or causing significant and disproportionate displacement of costs to other parts of the Ministry of Defence. In order to support export opportunities, consideration of the ability to adapt the accommodation layout to suit the needs of other navies was also invited. 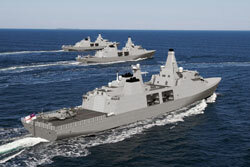 A number of designs were proposed for the Type 31e, including Babcock’s Arrowhead 140 design, based on Odense Maritime Technology’s Iver Huitfeldt class frigate, which is in service with the Royal Danish Navy, supported by a consortium that also includes Thales, BMT, Harland and Wolff and Ferguson Marine; and a ‘Leander’ proposal from BAE Systems working with commercial shipbuilder Cammell Laird. As highlighted in the October 2017 issue of Warship Technology, the Type 31e faces stiff competition in the export market, although UK shipbuilding recently received a huge boost when BAE Systems, proposing a Global Combat Ship variant of the Type 26 frigate, was selected as preferred tenderer for the Royal Australian Navy’s Project SEA 5000 Future Frigate programme (see elsewhere in this issue). Among the potential international competitors faced by the Type 31e are a version of French company Naval Group’s FREMM class frigate, and a version of the Federal German Navy’s F125 Baden-Württemberg class frigate. Others include a version of the Sa’ar 6 corvette from Thyssen-Krupp Marine Systems and the F100 Alvaro de Bazan class frigate from Navantia in Spain. Also comparable with the Type 31e is South Korea’s FFX/F2000/Incheon class. There are of course other alternative exporters with established designs: Russia and China. The former could offer a version of the Russian Navy’s new Project 22350 (Admiral Gorshkov class) frigate. China also has a modern offering for the international market at around the same price as the Gorshkov and the proposed Type 31e in the form of the Type 054A frigate for the People’s Liberation Army Navy.